“Ik Ben Zoho” (I am Zoho) was born as a academic proposed intervention for enhancing communication and community awareness within the Zomerhofkwartier (Zoho) in Rotterdam, during an Action Planning workshop in December 2013. It was soon decided to make this intervention real and also thanks to the support of local stakeholders the initiative was launched at the beginning of 2014. Besides a facebook-based community https://www.facebook.com/groups/ikbenzoho/, we developed a “non-magazine” in English and Dutch, collecting stories, ideas and actions from people engaged with the community. This first Issue features four stories; The Holland Road, working in a concept of a living room where people meet and talk; The Exchange Economy, encouraging people to exchange time and skills to solve each-others’ issues; the Tea House, a place where tea is planted, hosting a welcoming drink for a welcoming place; and finally the IK BEN ZOHO initiative itself. The design of IBZ#1 was curated by a lcoal designer Bart van Haren. Through this entry we would like to introduce ourselves: we are Christien van de Sande and Jorien Minderhoud, The Holland Road Foundation. The Holland Road, the living-room of Rotterdam, to meet each other and learn from each other. 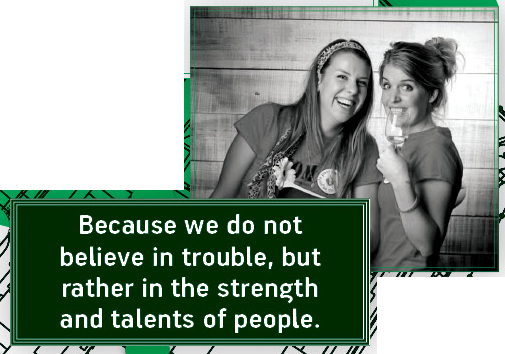 Because we do not believe in trouble, but rather in the strength and talents of people . Because we do not believe in giving aid, but rather in providing that listening ear. Because we do not believe in individualism, but in connecting! Briefly, we want a living-room for everyone really drop. The Holland Road is the place in Rotterdam to meet, learn from each other and enjoy healthy world cuisine together. A warm nest where talent is spotlighted through learning-working, workshops and simply a good conversation. We want to inspire young people connect to apprenticeships for “vulnerable” young, and (through The Holland Road) also with business. Talent development, sports, following modules (for communication, application, financing) and connecting are key features. With the aim of increasing the opportunities for young people and a self-sufficient organization with its own business model, therefore not depending on operating grants . – Study, work, get involved ! Travelling, we come to you to enjoy a delicious meal together! To socialize, eat, meet, get to know each other. So, do not sit at the table with your own group of friends. No, just sit down at the table with a group of people who you would like to speak with, but did not get the chance to meet yet! The kitchen table conversations are always on Thursdays at different locations. A conversation lasts from 18:00 to 20:30. Doors open at 17:30! As a consequence, I believe it is the way to confront the strange feeling of living in a society. In fact, only looking at the world is not enough to understand different levels of reality. Thus my training is on experimenting systems in life; the forms, the metaphor and the structures. I look at the inputs and give personal touch considering the local taste. Certainly though I am a curious one on different methodologies, modeling and manufacturing. I go through the continuous development and change from what I have learned: if you make something yourself – simple or complex – you can understand and approve that things can be distorted in custom and common manners for long term survival plan and applying the challenge on systems for pleasure and luxury. Likewise, if people around are a part of the process of making, it gives variation, therefore a way of thinking on adaptation of systems and beauty. We are in a time where we count our debt in commons and against that stress, and there are already alternative living models in different locations. For that reason I currently live on to set a collaborative platform in agniesebuurt for all ages; a home for commons where you can exchange data as well as tools, to assist the share of knowledge and ideas, not only to be conscious, rather acting in creating imperfect subsystems and events in peer-to-peer and do-it-with-others principles. It is concentrated on the essence of cultural mechanisms and practice of feasibility of components; services, products, spaces. It is not a hobby or business but busyness. Not only being together but doing together and create new values in working on commons with trading the precious time instead of selling it. It is not volunteerism. It is about to get advice and hands from experts about the things you might not have normally, and pay it with your own potential. Contributors offer special skills, efforts and/or a need, and everything is valued with time. At the end, creating long term sustainability and solidarity with an alternative behavior to the current system. That is so called the exchange economy. That is to create financially and emotionally an engaged community in order to get plenty of advantages in smaller scales. In fact, if you take time and convert into meaningful social interaction, you supplement the system which is starving for cash, and eventually, you have less connection with money and more solutions without it. Sign up yourself for experiment and exchange, to look for possibilities and alternatives. The name Zomerhof originated from the open space created in 1777. This was built with the aim to escape the hustle and diseases of the city and to enjoy nature. Central to the public space was the teahouse, which was built to enjoy tea and the environment. It was the place where people met and enjoyed nature. Despite the current Zomerhofkwartier has little relationship to the ever so beautiful “countryside” open space, the quality of the neighbourhood and feeling of peacefulness is maintained. Finding peace and nature in the bustling city of today is unique. With the aim to bring these ideas back, to the current Zomerhofkwartier, the first stage was the construction of the Tea / House. The Tea / House has been placed on the site NU HIER on Schoterbosstraat. The house which is literally an archetype house is covered with tea plants and is built entirely of old pallets by companies around the Zomerhofkwartier . What are the Impacts of the project to the neighborhood? 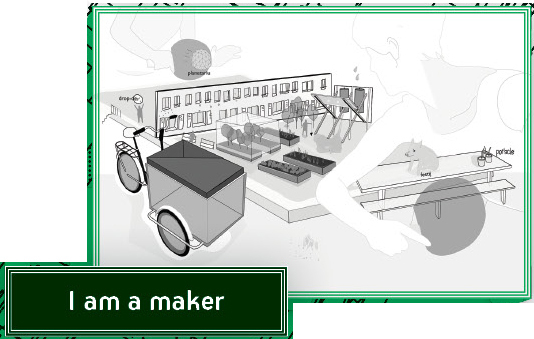 In the Tea / House , I will be meeting various residents, entrepreneurs and specialists from the Zomerhofkwartier. Many of them have plans, ideas and sometimes dreams for the district. In the beginning I contacted everyone who entered the house by themselves. Tea is very binding! In almost every culture, tea is a welcoming drink. That’s what I want to achieve with the Tea / House. In it, I want people from the neighborhood to connect with each other and introduce them to know and connect with the nature in the city. In the coming summer months, I hope this will come to life as naturally as possible, and residents, businesses and entrepreneurs will meet in the Tea / House. It should be a place from the neighborhood to the neighbourhood. What is the plan of the project for the future? In one of the conversations in the Tea / House, I metI Yasemin Sengil. She is a local resident of Teilingerstraat who has many dreams for the Tea / House. Together with Yasemin we will hold a workshop in early May, for sowing and planting of tea bushes on the sides and on the roof of the Tea / House, as the weather is good enough to plant. Then the Tea / House will really come to life and people will be able to drink tea there. At the place where nature is tasted, seen, smelled, and felt – and all that, in the city! Before planting the tea we invite local residents, business owners and interested people to become familiar with the place, so that as many people as possible know about it. In the coming months there will be more workshops to jointly pick and drink the tea. For anyone who is interested to participate in the Tea / House my contact is below. Would you like to know who is living on the next street? Who is that girl you see everyday walking by? Who are the people who work in the neighbourhood? What is happening here every day? In our neighbourhood there are a lot of familiar faces, and people who look like strangers. But one thing is common to all of us: we spend our days around the Zomerhofkwartier! IK BEN ZOHO is a project aiming to connect the people of the neighbourhood through a facebook group, face-to-face contact and this magazine. The content of the magazine is you, your ideas, photos and life stories. With this magazine, we can shape Agniesebuurt and Zomerhofkwartier the way we want it. Just through good communication and our good ideas. Let’s get it started, join the group and the discussion, interact with other residents, people who work or hang out here. Let us know your ideas and opinions, let the rest of the neighbourhood know YOU! If you are in ZOHO, IK BEN ZOHO! The IK BEN ZOHO project was created as part of the Zoho Action Planning workshop – within UMD (Urban Management and Development) MSc program of IHS (Institute for Housing and Urban Development Studies – Erasmus Universiteit Rotterdam). Participants developed an analysis of the issues and potential of the Zomerhofkwartier area. One of the issues identified was the lack of community feeling, especially a lack of integration and communication between local residents and the creative industry professionals operating in the Zoho/Agniesebuurt area. Those findings were confirmed during discussions with representatives of various stakeholder groups. In this framework, and with the vision to contribute to a connected and lively society starting from the neighbourhood level, we developed the Ik Ben Zoho project. Zomerhofkwartier with its active and diverse human capacity, with numerous social and creative initiatives springing up, is the perfect location to innovate in social communication and participation. We are looking forward to a unified and strong, diverse, urban community.